Our perfect poplin shirt, this time featuring our semi-spread Bank collar. The Bank collar is a nod to the house style of Budd's one-time parent company, Webster Bros, which was located in the City of London. 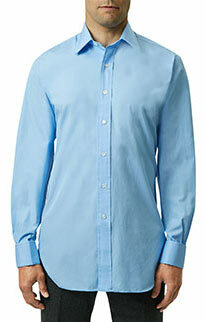 A poplin shirt is a basic of any wardrobe. Woven in 2 fold 100 cotton poplin, this shirt is cut to our classic block, but the collar provides a little differential. A very English shirt. Our classic fit shirts are a part of our heritage and represent the original, Budd shirt. 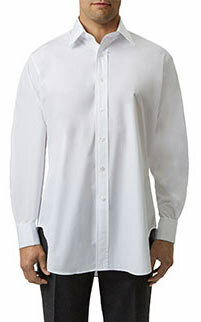 They are cut a little fuller; we like to say they are the shirt of those who enjoy a good lunch. They are very much in line with the Jermyn Street tradition of shirtmaking. The collar is hand turned, fully lined and unfused. The placket is hand folded (40mm), as are the side gussets. Cornflower blue is an elegant, blank canvas. 2 fold 100 cotton poplin. 2 fold 100 thread poplin. Sustainably sourced Mother of Pearl buttons. Cornflower blue is an elegant, blank canvas. 2 fold 100 cotton poplin. Semi-spread Bank collar. Fuller, classic cut. Double cuff. End on end weave. 2 fold 100 thread poplin. Classic, fuller cut. Budd forward collar. Double cuff. Sustainably sourced Mother of Pearl buttons. Made in England.